To agree to proceed with the implementation of a 20mph limit on Borough roads pursuant to an experimental traffic order which shall take effect for a period not exceeding 18 months and authorise the Corporate Director Communities, Localities and Culture to approve all necessary experimental traffic orders under the Road Traffic Regulation Act 1984 to facilitate delivery and to take all steps incidental thereto including but not limited to publication and signage and carriageway markings. The go live date for the implementation of the new speed limit is 1 April 2015. UPDATE: Date amended to 13 April 2015. 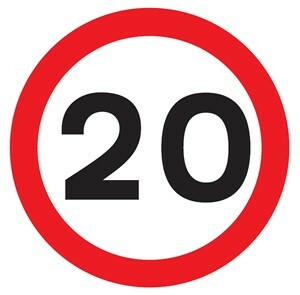 The "Borough-wide 20mph Limit" report that was presented to the cabinet gives the reasoning for proposing the 20mph limit, costs, benefits and overview of the consultation held towards the end of 2014. Pleasingly, 60% of the consultation respondents were via our online campaign. If you submitted your support, thank you for helping our borough become a safer place for all to travel around in! In addition to the Cabinet's decision, Transport for London announced today that they would be implementing a 20mph speed limit on Commerical Street for a trial period. After review of this trial they will consider reducing the limit on other TfL roads within the borough as requested by LBTH's initial proposals. Obviously Whitechapel Road would be a prime candidate with current Cycle Superhighway 2 plans having a break in the protected space past Whitechapel market.